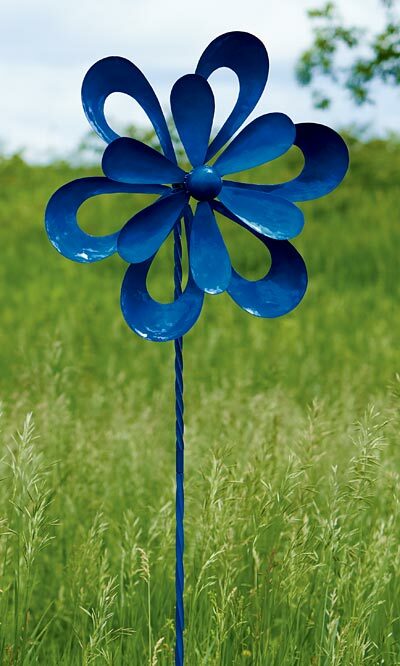 Add a bright and everlasting bloom to your landscaping with this Ancient Graffiti Kinetic Blue Floral Cutout Spinner. The vivid, glossy blue finish, hardy iron body, and recognizable flower shapes are sure to bring attention and a fantastic, floral hint to your garden. A generous, 68" tall shaft adds height to this piece, while its metal construction ensures durability. An arm attaches to the top of this shaft, extending 7.5" outward and supporting the two toppers. Six open petal shapes form the larger, 21" diameter accent, while a smaller, 14.5" diameter flower shape connects in front of this for dimension and style. Bearings in the hub of each topper allow them to spin easily in the wind, while the striking blue color and glossy finish reflect sunlight. Three pointed legs on the 15" wide, step-in base keep this unit stable in your soil, and the iron construction remains strong for several seasons. Enhance your garden with a dynamic, floral shape and bright color using this Kinetic Blue Floral Cutout Spinner. Assembly required.